Mini cast iron witch cauldron and incense burner with a lid and handle for your ritual and altar use and for preparing and burning herbs and incense, oils or votive wax. It is made for ritual use, but can also be used for cooking or decorating your kitchen, study or altar. 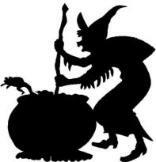 Measuring 2 3/4 inches tall x 3 inches in diameter this great cauldron will hold up to 6 ounces. Made from pure cast iron and is food-safe. Shipping is free. Great cedar herb kit includes a velveteen bag with an embroidered witch hat and metal crescent moon and with a silver plated witch on a chain. Includes an ounce of naturally grown and dried cedar herbs and a purple velveteen bag (5" X 4") and the soapstone burner bowl with lid and sand to protect the bottom and a brush to clean the burner. Place lid on the bowl only when you are ready to stop burning the incense. Free shipping. This black witch's altar incense burner is made of soapstone and is commonly used to burn smudge sticks, herbs and incense. It has a carved witch's pentacle with circle design. The bowl burner can be used for resin incense, powers or smudging sticks. Measures 4 inches X 2 1/4 inches. Shipping is free. A tall incense charcoal burner with hand carved witch's pentacle and circle symbol. Made of black soapstone and has the Celtic knot design. This Burner can be used to burn herbs, smudge sticks, powder incense and resin incense. Measures 4 inches tall and 4 inches wide. Shipping is free. Witch's brass charcoal incense burner with screen is great for burning your herbs and incense. Has a carved pentacle and comes with a wooden coaster. Measures 2.5 inches X 2 inches. Shipping is free. A smudge pot is used to remove negative forces and unwanted energies from your entire household. Use our cedar or sage to clean out negative forces and cleanse the air around you. This black metal smudge pot is specially shaped to prevent sparks and ash escaping. You can burn incense safely as it sits on the ornate wooden base which is included in your purchase. Measures 3 1/4" X 1 1/4" and includes wood base which has a 2 1/2" diameter. Shipping is free. Great cedar herb kit includes a velveteen bag with an embroidered witch and metal crescent moon. Includes an ounce of naturally grown and dried cedar herbs and black velveteen bag (4.5" X 3.5"), soapstone burner bowl with lid, sand to protect incense burner bottom and cleaner brush. Use lid to snuff fire when finished. Free shipping. One roll of 10 Swift Lite charcoal disks (33mm) in an individually wrapped package for burning dried herbs, incense, resin and wood powders. Each charcoal disk measures approx. 1-1/2" in diameter. Shipping is free. Great cedar herb kit includes a black velveteen bag with an embroidered white witch's star symbol and a silver plated witch's hat on a chain. Includes 1/2 ounce of naturally grown, dried cedar herbs, soapstone burner bowl, black velveteen bag (3.5" X 3"), sand to protect incense burner bottom, and cleaner brush. Use lid to snuff out fire when finished. Free shipping.